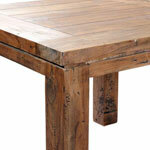 Elegant simplicity in reclaimed teak with a stunning black wash that highlights the grain perfectly. The mass produced tables on the market today tend to use bolted joints that are inferior and run the risk of developing that annoying wobble over time. Mortice and tenon joints are cut by hand and then reinforced with teak dowels to join the separate parts together. These are then further reinforced by chunky holding panels bolted to the mainframe to offer long-lasting strength every time. The chunky table top is 12cm thick and has teak rivets underneath for further strength and the robust legs are 11cm square. The tight knit grain swirls beautifully across the length of the table – a quality only found in the finest Reclaimed Teak – and the fact it is reclaimed means it does its piece for environmental concerns around deforestation overseas. This also gives it unrivalled resistance to the elements when used outside the home – the abundant oil content offers low moisture uptake and natural protection against chemical attack, fire and insects. For further information please don’t hesitate to speak with a member of our Sales Team.